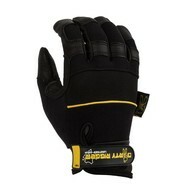 Still includes Dirty Rigger's double stitching and palm comfort pads plus the super soft sweat wipe on thumb-side. Dirty Stitch, double stitching, so extra strong! ID Tag, so everybody nows there yours! Dirty Sweat, soft fabric to wipe away your sweat! Strong velcro shutter, extra strong and won't let go!